I have spent years wondering why more older women in the church haven’t stepped up to mentor. And then I spent a few more years trying to figure out how to make women wake up and help younger women who are drowning. Then one day God nudged my heart and I realized that it’s wasn’t the other women…it was me. God was calling me to mentor. That’s why it was on my heart. He didn’t want me to get up and plead in front of the church for older women to sign up. He didn’t want me to lay out a to-do list to an already overloaded group in the church. He wanted me…me to reach out to a younger woman in the church. Me with 6 kids still at home. With a toddler just learning to walk, a busy teenager in a million things, and an already-full schedule. God led me to 3 younger women to mentor…then 4. Somehow God found the time in my day. I don’t know how He did, but the moment I reluctantly said, “OK, God…but you’re going to have to figure it out,” is when things started to fall into place. These younger women have changed my whole view of mentoring, and have honestly blessed me more than I feel I have blessed them. They didn’t need a to-do list of how to be a better wife or a better mother. They didn’t need me to have my life altogether and impart all of my hard-won wisdom. They needed someone who would listen and who relied heavily on prayer. They needed someone who was trustworthy and wouldn’t gossip about them. They needed someone who understood that the cross changes everything. As Titus 2 says, the purpose of teaching younger woman is sound doctrine. That word “malign” is also translated “blasphemed” or “reviled.” It means to teach something that is contrary to what God says or give another means of faith than the Gospel. When you understand the law and the Gospel, and how it applies to our marriages, our children, and even our home, it brings freedom. It is burden lifting. You see, we can’t just will ourselves to do this godly list on our own. We needed to be rescued by Jesus. It is through Him that we can do all things, not ourselves. When we try to do them on our own strength we fail. Understanding the purpose of sound doctrine is key to understanding this whole passage. My heart broke as the younger women each shared her story with me, which felt so familiar to aches I had lived through. God filled me with compassion for these younger women, as we mourned together, brainstormed together, and fought off the lies of the world with God’s truth together. Helping them have a firm grounding of their identity in Christ, and everything that means, grounded those ideas deeper into my own heart. I didn’t expect that. I didn’t expect that this theology that I had learned through God’s Word and experienced in my life would turn into weapons to fight the lies constantly being shot at the younger women in our church. I learned how to do battle. It was fantastic! More than ever, I believe that mentoring isn’t a program to be launched by women’s ministry teams, with sign-up sheets and pairing up. Mentoring is a culture within our churches, fostered by the community of the women’s ministry. It’s not something someone will assign to you. It starts with God. Then He offers it to you. Then you take what He gives you and offer it to a younger woman within your reach. It’s that simple. They did not think younger women wanted to hear their advice. They didn’t feel they had their lives together yet. They didn’t want to be the one to add more to do on an already exhausted woman’s plate. But what if mentoring wasn’t about legalism, or having it all together? What if it was about the Gospel? What if it was how the Gospel changes everything, even the intimate areas of our lives? What if we just continually pointed her face to Jesus regardless of the circumstance, and left all of the leading to Jesus? Out of my experience, God led me to develop an online course called Gospel Mentoring. 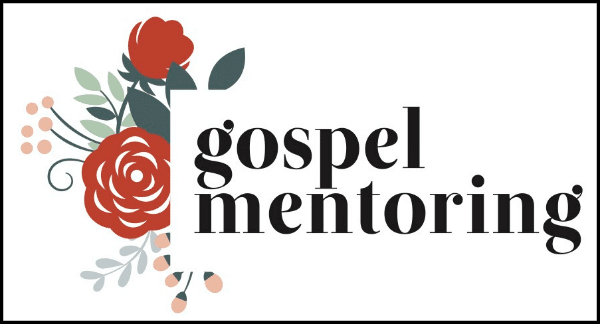 Gospel Mentoring is a self-paced study for individuals who want to learn how to mentor younger women in their church with this gospel-centered approach. I take you step by step through the process of approaching a younger woman while keeping your eyes fixed on Jesus. 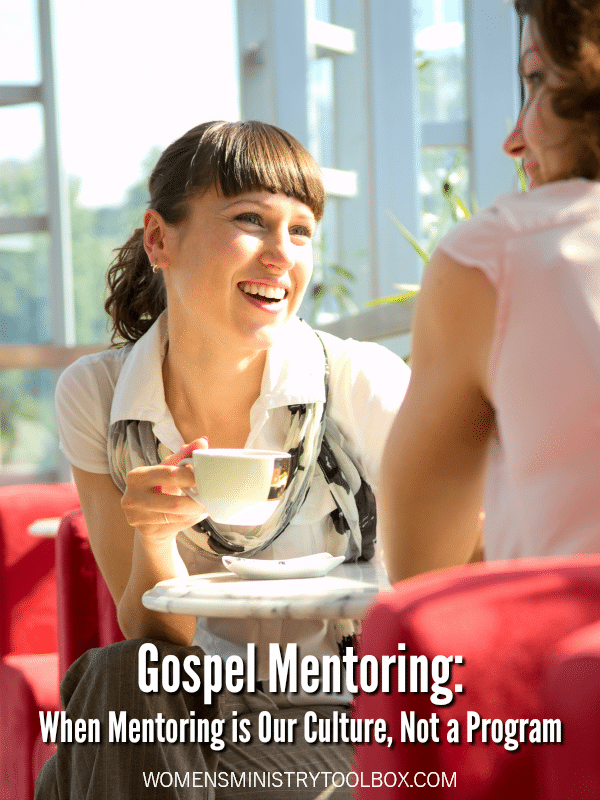 Enrollment for Gospel Mentoring is open now. You’ll find all the details here. Disclosure: This is a sponsored guest post and contains affiliate links. 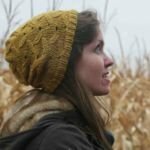 Gretchen is a mom of 6 from toddler to teenager, living in Minnesota with her husband on the family farm. She writes regularly at her blog: www.gretchenronnevik.com. She loves tutoring middle school kids at her homeschool community and is passionate about mentoring younger women, classical education, and Bible studies. I had a similar experience when I was in my last job before I retired. I was the oldest woman in my department of 12. Most of these women were young and did not have a relationship with God. I did not realize I was mentoring until I left my job and received so many notes of thanks for listening, for praying for them, for helping them make decisions. We even started a prayer chain with Christians all over the building and when new management would not let us use our email for prayer requests, we used the phone for a call to prayer. It took me a long time to learn it, but now when God points out someone to me, I try to make a connection as soon as possible. Listening and genuinely caring is what they usually need. Awww such a great post here on doing life with younger moms and what mentoring looks like. I was trying to find a video sample on her blog but didn’t see anything. Are you aware of anything out there – a snippet or anything to represent what’s in the Gospel Mentoring video series?